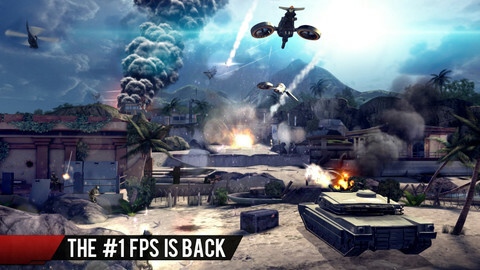 Modern Combat 4 is Gameloft’s latest attempt at bringing a solid FPS to touch screen gaming, which sounds like a pretty ambitious feat when you read that, and it is when you consider the limited screen real estate they’re working with. Luckily, the customization options, such as making any button on the screen movable and scalable, make the initial shock abit more comforting. Although the game doesn’t actually let you know you can customize the controls straight away, once you figure it out, the controls can become bearable after about 15-20mins. That’s my only problem with the basic premise of an FPS on a phone, whose going to make that effort if it’s not easy to pick up? Simply moving your character around is the hardest part you’ll adjust to, and sliding fingers over which way you walk limits the screen real estate even further. It’s a clunky experience, but it’s not one without merit. Firstly the visuals, whilst not artistically special, are some of the best I’ve seen on a portable device. The textures, the special effects and some of the animation really make you feel like you’re on a battlefield, right in your hand. 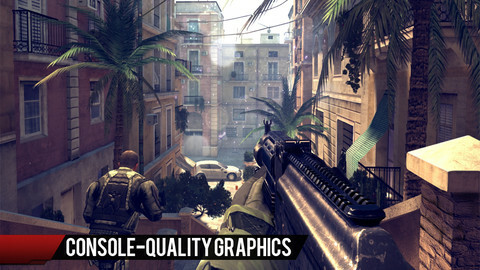 The style however is pretty much limited to a Call of Duty rip off, which is not really a bad thing when you consider any other FPS on the platform. I certainly can’t think of any that come to mind, other than something like Epoch. Some of the animation isn’t up to scratch, and when you look at the rest of the game, it can stand out. Death-animations, which have improved from previous entries, are still clunky and unnatural. But once again, being spoiled by console quality animation can make you forget about your little mobile brother, which is slowly improving. The dialogue isn’t something to write home about, it will annoy you with things thrown around about killing americans and generic observations on conspiracy theories, nationalistic vigor, and, of course, terrorism. The highlight would have to be the soundtrack, the combat dialogue and menu screen music, they feel genuinely suitable to the games style. Controls are a big deal in First-person-shooters, I mean you really appreciate it if you get total accuracy. This isn’t always going to be the case with MC4, but going into it you’re pretty aware of that. You’re better off playing this on an iPad is all I can say, where your fingers are less likely to get in the way. Once you’ve built momentum with your phone though, MC4 can be an enjoyable experience. The story leaves a little bit to be desired, especially the dialogue. The basic premise is terrorists, nuclear threat and rescuing world leaders. Sometimes you play the good guy, sometimes you play the bad guy. The bad guy is probably the highlight, especially with hilariously cheesy dialogue. To be honest though, I wasn’t invested in any of the characters, hardly remember their names and wasn’t volunteering to review this game because of the story. This brings me to level designs, which include all the standard set-pieces from modern shooting games, except on your mobile. Unmanned drones, snipers, being separated from your squad and being vastly outnumbered are all here. If you have the time, online multiplayer is once again the star of the show, 12-player deathmatch battles and team objective-based modes are remarkably good, when you consider the entry point for the price. However the in-game purchases to unlock weapons is a bit of step in the wrong direction, which may turn you off the whole thing. But if you’re up for a decent FPS experience in your hand, taking cover, knifing people, finishing some decent set pieces and fun multi-player, MC4 gets it right most of the time. 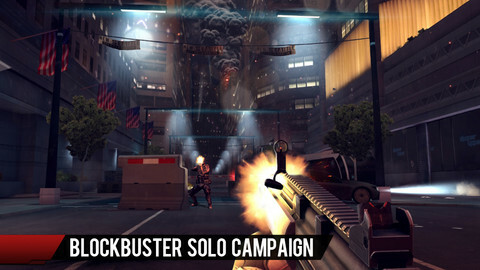 Modern Combat 4: Zero Hour isn’t going to win any real awards, but it’s a step in the right direction for mobile FPS, you can’t deny it once you play the game. Perhaps one day people will be sitting around arguing joysticks vs fingertips vs mouse/keyboard, that’ll be the day. Until then, we have the teething pains that is MC4 and it still manages to be enjoyable.